Smartphone controlled APP : You can scan the QR code on the product to download the app. This software is supported by Android 2.3.3, iphone 4S with IOS 7.0 or later versions. The broad compatibility allowes to combine music and control from your Wireless device of your choice. Music playing via Wireless : Built-in Wireless speaker to enjoy music anywhere. Connect to your Wireless devices easily. You can choose Manual control or Automatic control. Play music from the app or your usual program and have the bulb change colors automatically. 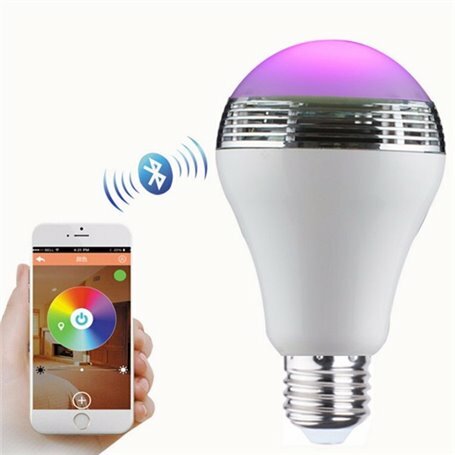 This smart light bulb can plaz your music, match the lights to the music, has a normal white lights mode, can adjust the brightness, can be renamed and can set a timer in the app to switch off/on. Wake up to your favourite music and color or come home with lights already switched on. Applicable for any household, hotel, shop etc. The high quality speaker inside the bulb will play back your music with an amazingly clear sound and enhanced base. Since its a 2-in-1 this speaker will not use any space and therefore saves you space in your apartment. Your friends will be amazed where the music comes from. ABS and PC fire-resisting materials, High quality warranty, safe and reliable.